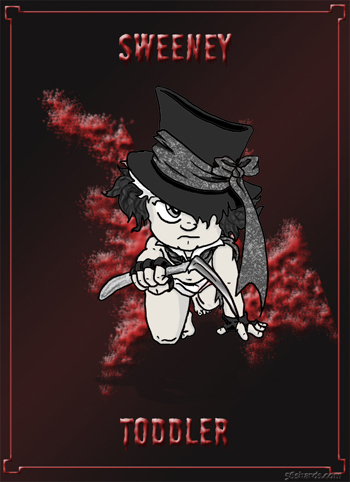 Abilities: Extremely fast and able to slow down or speed up time in all three forms, the individual abilities of each are as follows: Sweeney Toddler has a deafening wail to confuse and stun, a confetti fog to disorient and hide in, and can transport anyone and anything in his top hat. He also has the look of an infant and that lends to his escape as well. Sweeney Time can, by touch, instill a drunken aura or a depression aura on his “marks”. He can also animate his hair to instill such an aura if he touches his intended victim. Father Todd and has the touch of death and can control time the strongest with his hourglass. Weakness(s): Time. He is both trapped in it and run by it. Though able to mess with the ebb and flow, he is always forced back into the pool of Ttime, unable to get out. And, as with the Penny Dreadful stories of Sweeney Todd, Sweeney Toddler is “mortally afraid of dogs”.